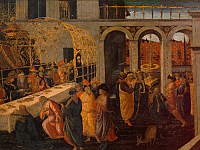 On the left side of the room are displayed huge panels representing the Seven Virtues, a subject the Merchant's Guild asked Piero del Pollaiolo to paint . 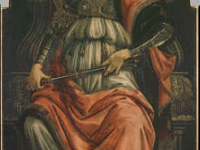 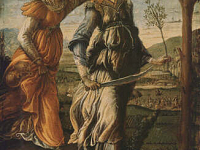 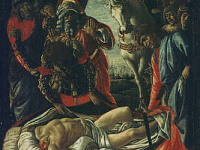 Nevertheless, Piero just painted six of the seven panels and the series was completed by Botticelli, who painted The Fortitude. 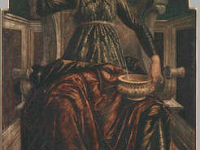 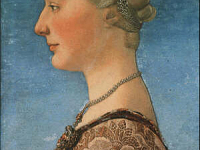 This is one of the very first works by Botticelli and was painted in 1470. 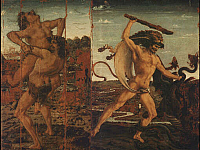 Very interesting are the little paintings by Antonio del Pollaiolo representing two of the twelve Labours of Hercules: Hercules and the Hydra and Hercules and Anteo, full of dynamic intensity.